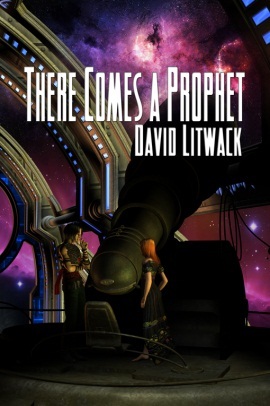 Today I’m pleased to bring you an interview with author David Litwack, published as part of a whirlwind blog tour to promote his books Along the Watchtower and There Comes a Prophet. In the interview, David talks about the inspiration for his books, including his fascination with fantasy role-playing games, his own favourite classic books, how as a busy author and self-publisher he finds balance in his life, and how he likes to unwind! Please enjoy this interview with David Litwack, author of the gripping contemporary novel, Along the Watchtower, and the deep, dark dystopia, There Comes a Prophet. 1. Along the Watchtower is a powerful blend of contemporary fiction and fantasy that demands the reader’s attention from start to finish. What was your inspiration for writing this work, and for combining World of Warcraft with a casualty of war and a dream world? I’ve always been fascinated by how we perceive reality. Think of the film Rashomon, the classic exploration of multiple realities, where several witnesses to a crime describe events completely differently, each bringing their own life experience and biases into play. But it’s when we’re ripped from our normal life and placed in extreme circumstances that our reality becomes totally fragmented. Such is the case with hospitals and war. At the same time, I’d become engrossed in playing the online fantasy game, World of Warcraft, with my son, an avid player. With me on the east coast and him on the west, he suggested we meet weekly in the fantasy world of Azeroth—an invitation I could hardly resist. For several months, we had a Wednesday evening appointment, where our avatars would meet in this virtual world and go on quests together. I was struck by how totally immersed I could get in the game, how quickly time passed, and the surreal mood of wandering around in castles and crypts, solving riddles and following quests. The fantasy gaming experience has a dream-like quality to it. And I began to wonder: how would this experience affect the dreams of someone whose reality has been fragmented by war, PTSD, and traumatic brain injury. These concepts—war, hospitals, and the fantasy world of online gaming—came together in Along the Watchtower. The video trailer (below) graphically illustrates how in the novel the two worlds become intertwined. 2. Without giving away too much, can you introduce us to the main character Lieutenant Freddie, and tell us how he’s similar and different in both worlds he inhabits? When Freddie comes out of his medically-induced coma in the VA hospital, he’s nearly given up hope. Everything he had to live for was gone, and he was racked with bad memories and guilt, in addition to his physical injuries. Prince Frederick doesn’t have the luxury of giving up. If he yields to despair, the kingdom that depends on him will fall into darkness. Because of this, he’s more willing to struggle through his trials. It’s through the prince in the fantasy world that Freddie is finally able to confront and overcome his personal demons in the real world. 3. Your first novel, There Comes a Prophet, explores the roots of the dystopian fiction category while also reinventing it for a younger generation of readers. This genre boasts many great classics including Slaughterhouse V, 1984, and Brave New World to name a few. What are your favorite classic books? Dystopia literally means dysfunctional utopia, not necessarily an evil, power-hungry regime oppressing its people, but a well-intentioned system that has lost its way, resulting in a world gone awry. My favorite such dystopian is Arthur C. Clarke’s The City and the Stars. In this near perfect world, there’s no disease, hunger or poverty, and people are effectively immortal. But all are afraid to venture outside the walls of their city or even look beyond them. The thought of the open expanse of stars in the night sky terrifies them. All of this had been put in place to protect them from some past too horrible to mention. Yet the unfulfilled aspirations of a single individual drive him to discover the lost truth and let humanity move forward again. Lois Lowry’s The Giver is another great example. In a simple but beautiful writing style, she tells the story of a seemingly perfect world where bad memories have been abolished, except for one person, the keeper of memories. But the people are left unable to feel anything much—good or bad. 4. People read books for many different reasons. Of all the different reasons you’ve seen in reviews, can you relate one story that really stood out for you about a reader’s experience? One reviewer read Along the Watchtower and it brought back memories of being a young college student, witnessing the twin towers fall on 9/11. The book touched him deeply, because it reminded him that, as a result of that tragic event, we’ve been at war his entire adult life. The shock he felt on 9/11 all came back to him in reading the struggles of the recovering Lt. Freddie Williams. Interestingly enough, that same reviewer had a powerful reaction to the dystopian world of There Comes a Prophet. In that book, a ruling power limits learning and growth. This reviewer associated my story with the courageous young Malala Yousafzai, the Pakastani girl who the Taliban tried to kill for advocating education for women. 5. 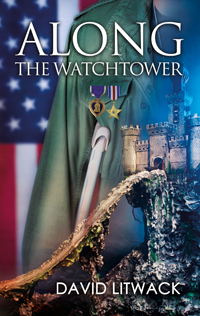 Along the Watchtower features a veteran’s healing process on the physical, emotional, and intellectual levels. What role do you think fantasy role-playing games and dreaming can play in a healing process? When we’re confronted with trauma too terrible to comprehend, our mind sometimes shuts the experience out to let us heal. But the memory still lingers in our subconscious. Sometimes it’s easier to confront those feelings through fantasy, like dreams or video games, rather than facing them head on in the cruel light of reality. Then once confronted, we’re better able to move on. 6. Symbolism and description play a huge role in the opening chapters of Along the Watchtower. As the lines between reality and fantasy become more and more blurry, did you find it difficult to remember which ‘character’ you were talking as? Freddie and Prince Frederick were undergoing the same trials at an emotional level, even though their circumstances differed. The hardest part in writing the two was to maintain a distinct voice for each—for Freddie the gritty language of the VA hospital and for Prince Frederick, more of a high fantasy tone. This difference was important to make each world believable. But since the book was written in a first person point of view, it was also critical to quickly alert the reader whenever there was a switch in worlds. 7. Ocean imagery features prominently in your book Along the Watchtower. What’s your favorite place to visit, and what scenery do you find most inspiring as an author? I almost hate to mention this because it’s such a well-kept secret. But my favorite spot is a place called The Knob in my home town of Falmouth. It’s a raised spit of land rising up dramatically into the harbor onto a domed rock, reachable only after a half-mile walk through the woods. I’ve actually used it as a setting in my upcoming novel, The Daughter of the Sea and the Sky. 8. You run a very active blog and website, though the demands of marketing yourself can be overwhelming for many authors. How do you find balance in your life, and time to enjoy your surroundings in a highly technical world? Coming from a software background, I’m sure you might have unique insights on balancing the ‘real’ world with the technical one. I’ve spent most of my adult life in front of a computer, first as a software engineer and now as an author. The key is to take advantage of non-computer time to get out and enjoy yourself. But all writers want to be read, so you have to spend time reaching out to readers. The software equivalent was that I used to enjoy taking a break from developing software to visit customers and see how they were using what I’d developed. 9. You’ve published two books, Along the Watchtower and There Comes a Prophet. Is there anything you’d like to share with readers and your future writing plans? I’m in late stage edits with an alternate world story called The Daughter of the Sea and the Sky. It’s about a world divided between the Blessed Lands, a place of the spirit, and the Republic, whose people worship at the altar of reason. A mysterious nine-year-old girl from the Blessed Lands sails into the lives of a troubled couple in the Republic and seems to heal everyone she meets. She reveals nothing about herself, other than to say she’s the daughter of the sea and the sky. But she harbors a secret wound she herself cannot heal. I’m also currently planning what will be a sequel to There Comes a Prophet. I’ve always wondered what happened to Orah and Nathaniel after their world changing heroics and what became of the contemporaries of the keepmasters who had crossed the ocean. Stay tuned. 10. What do you like to do to unwind? You know, in those rare moments when you’re not writing! Since writing and social networking are indoor activities, I try to get outside as often as possible. I go for long walks on the seashore, play some golf, bicycle, and generally try to stay active. I’m fortunate to be able to split my time between Cape Cod and Florida, both beautiful places in their respective nice seasons.